In small bowl, mix all dressing ingredients. Cook and drain peas as directed on bag. Rinse with cold water; drain. In medium bowl, place shrimp, celery and peas. Add dressing; toss to coat. Cover; refrigerate at least 2 hours to blend flavors. Commercial curry powder is a blend of many spices, herbs and seeds. Its distinctive yellow hue comes from ground turmeric. You may find several types of curry powder in your grocery store, but the most common blends are labeled either curry powder (mild) or Madras curry powder (a bit hotter). 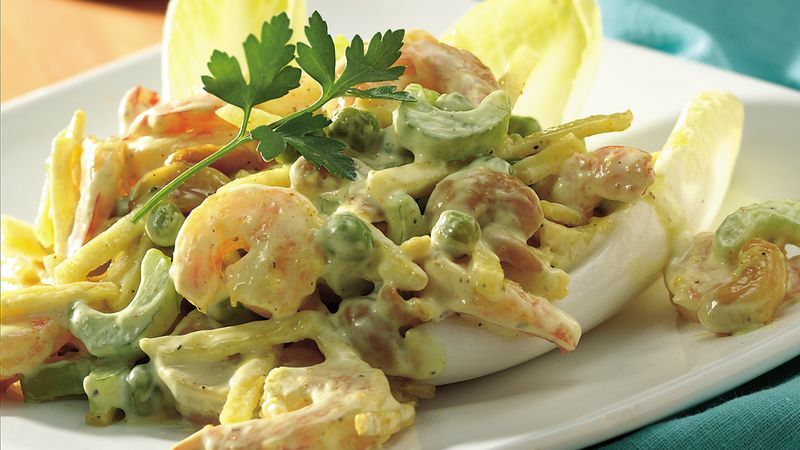 The shrimp mixture can be made up to 24 hours ahead of time, but add the cashews and potatoes just before serving. Also, the endive leaves can be separated, washed, wrapped in a damp paper towel and stored in a plastic bag up to 24 hours before serving.